Beyond its appearance, Cannes is a city that has an exceptional environmental and cultural heritage. 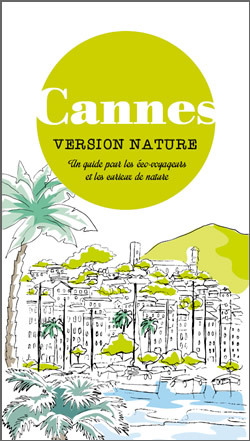 Discover Cannes in another way through these pages, to enjoy your stay in sync with the local environment. We are rolling out the Green Carpet for you! Visit the regions closest to you and limit use of transport. Opt for the train, bus or car sharing over car or aeroplane whenever possible. If you can, choose times of the year with less crowds. Take your time, group together your visits geographically, and think “quality” rather than quantity. Take interest in the environment, and also its inhabitants. As much as possible, favour the local economy by buying your produce from local producers. Choose your accommodation, where you eat, and buy things taking into account seals of approval that respect the environment and your health. Respect the environment : throw away and sort your waste, save water and energy, preserve biodiversity and inform yourself on the rules of protected sites. Meet and respect inhabitants : their tranquillity, their way of life, their traditions.